The House Theatre of Chicago presents THE MAGIC PARLOUR. My love affair with Dennis Watkins started several years ago. Even before I begin reviewing theatre, I saw the 2001 “Death and Harry Houdini” starring Watkins. Later, I reviewed “Death and Harry Houdini” in 2012 and saw him again in “The Magnificents” in 2013. I’ve even seen “The Magic Parlour” before in 2012. Last Fall, I hired him for an event to do strolling magic. To say I’m a fan is an understatement. It is more accurate to say I am bewitched. And I’m not the only one under Watkins’ spell. Recently, ABC-7 named his show one of the 100 things to do in Chicago before you die. THE MAGIC PARLOUR is at the historic Palmer House. Guests check-in at Potter’s Lounge on the lobby level. At the magic hour, Watkins himself escorts them upstairs to a private room. Guests are invited to settle in with a complimentary drink. Each show is performed for no more than forty folks. The setting and size of the crowd make for an intimate experience. It feels like a private party than a theatrical show with Watkins as the charismatic host. The debonair Watkins engages with charm, comedy and of course magic. He continually addresses us as ‘ladies and gentlemen’ to draw our attention. He sounds like a cordial ringmaster as he explains that he is about to fool us with a sleight of hand. And even though he warns us of the trickery to follow, he still mystifies us with his magical parlour games. He regularly pledges to ‘spark your wonder’ and ‘ignite your senses.’ And he delivers on both promises with ninety minutes of marveling feats. 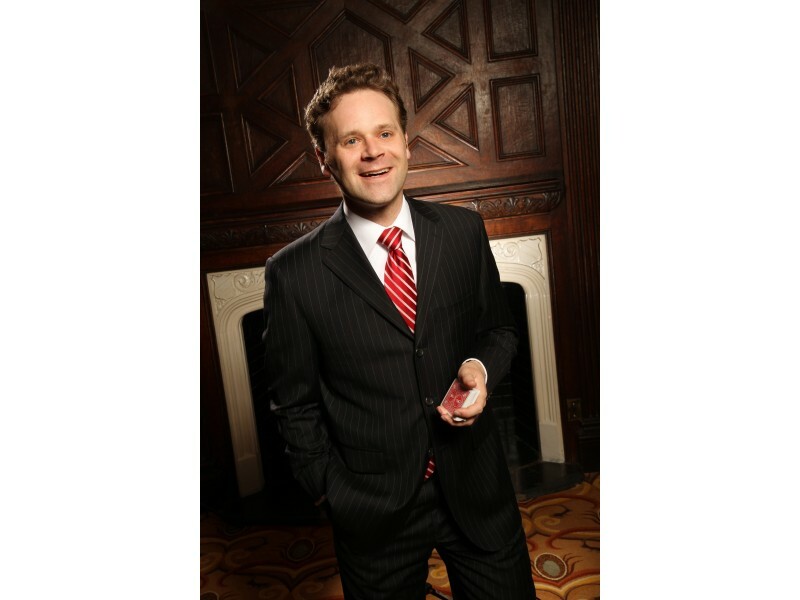 Watkins performs various card tricks, including an unusual card story. He invites everyone to gather around him as he lays out cards while telling a story. He shuffles the deck and even has a person regularly cut it. Then, the smooth-talking Watkins narrates a tale that features various numbers. His words line up perfectly with the sequence of cards he lays out. Watkins is a natural storyteller so the tale is already amusing but the match-up words to numbers is astonishing. My favorite card trick involves an oversized balloon that Watkins blows up and climbs in. He is inside this large balloon. A guest then throws cards at him and he is able to guess the one she picked by stabbing it. It looks cartoonish but it is seriously mind-boggling. This is primarily an interactive show. Guests participate as willing and eager participants. Watkins utilizes us for a variety a mind reading tricks. At one point, he has two guests place coins over his eyes followed by duct tape and a blind fold. He then accurately guesses three items randomly collected from the audience. Even while pulling off duct tape from his face, Watkins never stops his amusing commentary with his guests. He hits the ideal balance of perplexing and fun. Watkins has this way of playfully sparking our wonder. At the beginning of the show, Watkins assigns a person to watch over the ‘encore box.’ We effectively forget about it until after the standing ovation. As his guests scream for an encore, Watkins goes over to the undisturbed box and opens it. Inside is a callback to an earlier trick. Bewitched, bewildered and bemused am I by Dennis Watkins! THE MAGIC PARLOUR is going on hiatus in May and returns later in the summer. During that time, Watkins will once again be starring in “Death and Harry Houdini” with House Theatre of Chicago. I highly recommend you catch Watkins in both shows this summer. 2016 will be the summer of magic Watkins style.